When you think of chiropractic services, most people only think about the benefits that these services can provide to adults. Could chiropractic care be a benefit for children and toddlers as well? Yes, research has found that chiropractic services are beneficial for patients of all ages, including toddlers! Studies have shown that chiropractic treatment for individuals under 17 years old has increased by nearly 9% since 1991. If you have a toddler dealing with pain or other issues and you have not been able to find a beneficial treatment option, consider chiropractic care. If you live in St. Paul, MN, now is the time to team up with Caron Chiropractic Clinic, P.A. for our chiropractic care designed for toddlers and children. Throw away those unnecessary medications and focus on ways to help your body heal itself over the long haul. Through our non invasive healthcare and wellness programs centered around chiropractic services and physical therapy, our dedicated staff can create a program to help your child get back to 100% health. Our goal is to get your kid to the point where they can experience childhood activities pain free. Finding a provider that offers as gentle and relaxing an approach to youth chiropractic services as we do is hard to find in this area, and that is something that we take pride in! With adults, chiropractic care is often used to alleviate pain and help with chronic issues that you may be facing. With children, chiropractic care can help with pain relief, but research has shown that other chiropractic benefits include helping to manage asthma, ear infections, colic, bedwetting, and even breast feeding issues. It goes unnoticed, however that children accounted for nearly 30 million visits to chiropractors in the US in 1997. With a focus on wellness, our staff can utilize spinal manipulations to make sure that the child’s spine continues to develop normally. The level of pressure applied between chiropractic care for an adult versus a child is drastically different. Children’s sessions are very calm and gentle, while adults can be more intense. Ditch the child medications that come with a long list of warnings and invest in a holistic health option for your toddler. 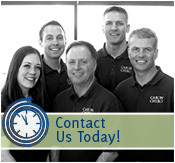 If you live in St. Paul, MN, team up with Caron Chiropractic Clinic, P.A. today for all of your toddler chiropractic services. Contact us today at (651) 255-9999 to set up an appointment for your child. This entry was posted	on Wednesday, May 27th, 2015 at 6:25 pm	and is filed under Chiropractic Treatments. You can follow any responses to this entry through the RSS 2.0 feed. You can leave a response, or trackback from your own site.